There are reasons why we can't walk through walls. Using magic, though, those difficulties fall away. In fact, for a wizard in an otherwise-almost-magic-free world, walking through walls or falling through floors is an ability he can harness on cue. The wizard has used his powers for evil, though, and after a long war against him and his armies, he has been defeated. The victorious army wants to keep him alive but imprison him. They quickly realize that this is a very hard thing to do, as he quickly runs out of a normal prison cell. In fact, they discover that he can escape from anything - ropes, handcuffs, etc. They only manage to move him from one place to another by constantly sedating him. How can they imprison the wizard without keeping him unconscious all the time? They only have medieval technology, though, so their options are quite limited. They want to imprison the wizard somewhere on the planet they live on, which is earth-like. He can pass through anything, but he has to hold his breath. He can designate an area of ground where he will not fall through at a given point in time. He can't fly; most of his other abilities are unknown, but he cannot transform some materials into others. It seems that there's nothing else he can use to escape. There are no other known wizards. This location must be somewhere on land, and must either be a natural feature or be buildable by medieval technology. This means that he can't be put in water, outer space, etc. (fortunately, these have not been suggested by anyone). The fact that he needs to hold his breath means he has a limited travel distance. Take a guess on how far he can run while holding his breath, then double it, and put that much stone between him and his next breath. You indicated that he can not fall through stone by deciding it, but can he climb virtual stairs inside solid rock? He may not be able to even climb out of a deep hole. If he can, just factor sprinting-up-stairs-while-holding-breath distance into the depth of the prison. How do you get into this cell to interrogate and feed him? Clearly any tunnel into this cell (or any of the other answers) would give him a place to run to. But it's easy, just use a long series of thin pocket doors. When the doors are closed the gaps between them and spaces which they will slide into for opening aren't wide enough for him to stand in and take a breath. As the guards come to feed or interrogate him they can open the doors and close them behind themselves. 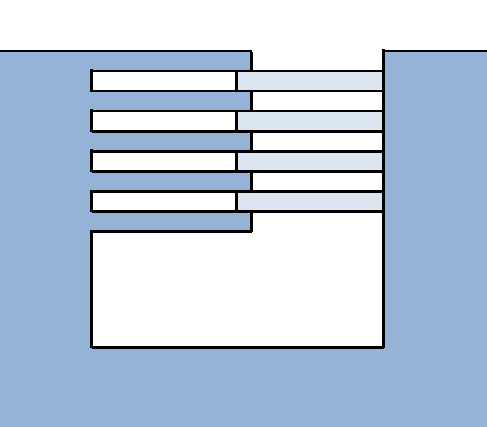 Depiction of pocket-door arrangement, not to scale. Alternatively, the surrounding material may not need to be solid rock, but simply any matrix of material too dense for re-materializing. Dense branches or a large volume of barbed wire wouldn't allow enough open air space to materialize in without catching a branch or wire in the gut. A combination of this and the stone prison could be used, really you could keep this guy in place with a regular jail cell and a whole bunch of bales of hay. Or even a jail cell in the center of a corn field. Why is everyone always over-complicating things? Step 1) Use a regular room, with a normal, possibly unlocked door. Step 2) Sever the evil wizard's Achilles tendons. Since he can't fly they could just hang him in a cage over a very deep pit. They could still drop food and water from above to feed him but any escape attempt would result in a deadly fall. 1) Strand him on an island. All you need is an island that is about 1/3 to 1/2 a mile from any mainland. This would ensure that he couldn't pass through the ground and make it back to fresh air in time. 2) Build a floating prison (read: boat), anchored to the bottom of the sea. This doesn't need to be so far off the coast as a regular island. His only option is to swim. Guards on the coast should be able to see him coming, and use whatever means they used previously to capture him. Drive a series of long wooden stakes into a lakebed, to form a circle. Keep each stake tightly touching the one next to it. Drive another series of stakes to form another circle, enclosing the first, about a half-foot further out. Now you have two concentric circles of stakes. Pour a clay mortar mixture into the space between the stake circles. This sinks to the bottom and displaces the water. Remove the water from inside the the clay walls by pump or bucket. Now the inside of the cofferdam should be relatively dry, and you can climb down and reach the lakebed. Create a stable foundation, and line the inside with stone, mortar, and pitch, to reinforce and waterproof. Note: this explanation came pretty much directly from the book World Without End, by Ken Follett. If there are issues with doing this as I've described in the Middle Ages, take it up with him. Now throw the wizard down in the water cell. You can cover the top, or not, it's irrelevant. For all he knows, he's been thrown into a regular well. Imagine his surprise when he tries to walk through the walls and instead of dirt, he finds he's surrounded by water - complete with spikes/traps/crocodiles/sharks with laser beams. Your guards can resupply him periodically, just boat out to the cofferdam cell and throw down what he needs. Build your prison like an inverted land mine. The center of the floor is a pressure plate which gets armed as soon as the wizard is placed upon it. The walls and ceiling are all out of reach and are composed of loose steel pellets packed in explosive black powder, surrounded by several feet of solid rock. As long as the wizard lies, sits or stands in the center of the room, the pressure plate stays depressed and nothing blows up. As soon as he approaches any of the walls, or changes the nature of the floor, or phases into the floor, or floats up on a bag of helium, his weight leaves the pressure plate and everything goes boom! Even if he is out of phase when it blows, millions of ball bearings will ricochet through his unsubstantial body for some time. It will be quite a while before the danger passes and the smoke clears. ...and all that time, the wizard will have to keep holding his breath and casting. If you were the wizard, how certain of your breath control, casting ability and concentration would you have to be, to even consider trying to break out of a prison like that? Removing the transformation abilities probably simplified a lot of the other answers, but it leaves this one pretty much unchanged. He can no longer fly or change the walls/floor, but those abilities were handled by the same pressure switch trigger which handled is other magical skills. Fresh air could be provided by a few small vents in the ceiling, each with multiple steel grates to keep the ball bearings from leaving the prison during a blast. Food and water can be lowered on a rope through the vent directly above the center of the room with empty plates and cups pulled back up after every meal. A pale can similarly be provided for removing his waste products. Care would be have to be take to insure that he is not fed more than the weight of the waste products removed so that he doesn't inadvertently set off the bomb through weight loss or gain. Interrogation would have to be handled through the vents with the high-ranking officials wearing armor just in case a stray ball bearing makes it past the grates. Given the tension of being surrounded by a 360 degree claymore mine, I doubt that torture or other motivations will be needed to get the wizard talking. Tower: Give him rope good enough to go into middle. Give him food into some place in the middle of tower, where you get using really tall ladder. If he wants food, he has to put his rope up and wait. Well is better, because you can simply throw bread down and there will be always some water. Of course, this depends on your ability to cauterize and sterilize wounds so the patient doesn't simply bleed out or die of infection. You're able to keep him sedated so that should help immensely with the surgery. However, medieval amputations were still risky business. If the wizard is otherwise affected by normal physics when they walk through walls, you can use a pulley system to hoist them in a cage or room far above hazardous ground. If they phase to escape, the fall and hazard would at least would cripple them if not kill outright. When you need them, you can place a platform over the spikes/moat/what have you and lower them down. All achievable with medieval tech. very painful (thorny, rough, etc.). He's a wizard, not a body-builder or soldier, so it's easier to make it likely that he would fall/fail in climbing the rope. Make it too risky to climb and it becomes an unattractive option. One could also add guards with crossbows as "deterrent" - climb the rope and we shoot your legs. The answers I've seen have all been about constructing an exotic prison, but I see a much simpler solution. My solution requires an understanding of how the wizard uses his magic. If he needs to speak to cast spells, cut out his tongue. If you want to interrogate him, use paper and pencil. If he has to wave his hands/fingers in complex motions, cut off his hands. The most difficult problem is if he can use magic just by thinking about it, you're going to need something exotic. Since he can transmute any substance into any other substance of the same state, you'll need a vacuum. After all, he can convert magma to solid rock so he suffers no heat harm from it and water to liquid helium which will evaporate instantly (either that or freeze him alive before it converts to a gas). The only thing he can't work with as you've described him is nothing. The real problem for an exotic prison is that, without magic, they're fairly impossible to build. Since he's the only known wizard, you're limited to either mundane prisons he can easily escape from or natural wonders involving deep pits. Find his best friends and family and keep them as hostages. That's a common ploy for taming superheroes. Hang him by his ankles with cuffs connected over a beam. As soon as he releases one foot he plummets to his death. The answer is actually rather simple. Build a tall tower, as tall as you can. Place a long metal pole sticking out of one side of the tower, as far out as you can. At the end of the pole, hang a tiny platform, capable of supporting only one man, and made of the thinnest materials possible; a wire net, for instance. Construct a system of pulleys and springs that hold the pole; if it gets too heavy or too light, the system fires the pole out and away from the tower, into open air. The fall through the air will kill the wizard; regardless of what gas he changes the air to, he will still fall through it, and regardless of what solid he changes the ground into, he will still splat when he hits it. The pole and the net will be thin enough that he wouldn't be able to use them to construct a balloon, and he won't have any other materials (say, for example, clothing) to use. He can't climb back towards the tower, or the system will drop him. He can't collect material to use in an escape, or the system will drop him. However, communication is simple, as you only have to yell across empty air. Food and water can be tossed over by unsympathetic guards, who can also trigger the insta-drop by hand, if need be. As an added security measure, the net should be supported by two ropes, held apart at the top. Each rope should be able to support 75% of the wizard's weight without breaking. Together, the ropes will hold the wizard and the net, but if the wizard tries to climb one of them, it will break, which will cause the second rope to also break, which will drop the wizard to his doom. Anyone can walk through a ring of fire, but he'll still come out extra crispy. Will require a lot of fuel to keep all that fire going, but since there's only wizard, they can probably afford it. If you want to keep him from getting out through the floor and roof, light fires there as well. An an added bonus, it'll be hot as hell in his cell, so maybe after a while he'll agree to play nice and stay put in return for you putting out the flames. Combined with "that's enough shenanigans, the next time you try to escape, we'll turn you into a porcupine". Assuming the wizard is not suicidal, he'll probably realise that if he leaves people no choice, they will eventually just shoot him and get it over with. You just need thick walls. [Comments]: [ArtOfCode]: How fast can he move when passing through things? [HDE226868]: @ArtOfCode No faster than a normal human could if the things weren't there. The world record for breath-holding is 20 minutes 21 seconds. However, not only will he be walking (or running) while trying to escape, but likely he's not the holder of that record. Most normal people can only hold their breath for around 2 minutes. Although that figure would be reduced with physical exertion, I'll leave it at that for simplicity and cell security. Usain Bolt runs at nearly 15m/s (~30mph). Again, our wizard is likely not him. Most normal people run at around 7-8m/s, 16.5-18mph. That means, in 2 minutes, an average person can run 960m. That's a lot. This figure does get reduced, however, since this wizard isn't breathing; assuming a quadratic reduction of his speed per unit distance, we get a figure around 450m. Still, building walls that thick is impractical, but there are ready-made walls you can use: underground. Imprison him deep in the Earth's crust and fill up your access holes with cement. If you give these people access to more advanced technology, you can install a video link and microphones for communication. I wonder if something like the setup they had for Magneto would work... a room suspended over lava/spikes/acid with the only entrance through the ceiling. I would build it like this. Take a deep, wide shaft. Line the bottom with spikes if lava isn't available. Build a room with no doors or windows, just a hole in the ceiling. Connect a heavy chain to the top of the room, and hook it to a windlass, which is suspended over the pit. Put the wizard inside the room, and then lower it deep into the pit. Throw food down into the pit through the hole in the ceiling. If the wizard tries to walk through the wall, he'll fall and die, same for the floor. Ok, new idea, no prison can hold this guy, you've made him too powerful, so instead imprison him inside his own mind. Give him a lobotomy or some similar treatment. He's still alive, but doesn't know who or what he is or what he can do. Now you can put him in a nice comfortable normal dungeon. So you need information from him, so a lobotomy might not be the best idea, as the information might be lost. You need him to talk about what he knows, so sensory deprivation. Guards have really short shifts, 30 minutes max so that they don't get distracted, but there is no talking allowed. A water pipe is rigged to allow irregular dripping down onto his prison. Not a steady pattern, so that the prisoner can't get used to it. Sometimes the dripping stops completely, but not for long. It's also his water source, so he'll love it and dread the sound of it at the same time. With transmuting out of the way, I think my answer stands, though now the shaft can be smaller. It can either be a natural cavern, or left over from a mining project. I has to be wide enough that he can't jump from the platform to the wall, so maybe 40 feet wide, which would give 15 feet of clearance between the platform (10x10) and the the walls. If it's left over from a mine, a shaft several hundred feet deep would be very easy. It would have been the shaft used to haul cars of ore up, so it would already have a windlass at the top. Food could be dropped or lowered by rope, and when they want to question him all they would have to do is raise the platform a bit if they wanted to. Being a cavern/mine, they wouldn't need to get him that close to the top to talk to each other, and wouldn't want him to get to close anyway, in case he has some offensive magic they haven't seen. How's his tolerance to heat? Can you keep him in a dungeon surrounded by a moat of hot water or oil? He may be able to walk through the walls of the dungeon, but may not be able to withstand being boiled alive by the moat. Making the ceiling smooth means that even if he can float up to the ceiling with his magical helium balloon, he won't be able to get a handhold to let him climb through the ceiling - the balloon will just bump up against the ceiling - though it's unlikely that his clothes would contain enough fabric to make such a balloon, it would have to be quite large. Putting the boiling water under the chamber as well too might make the floors too hot for habitation, so just leave it hollow underneath and let him know that if he tries to transform the thick stone floor to dirt and tunnel out, the guards will flood the underside of the chamber with boiling water as well. The walls, the door, the floor and the ceiling contain vacuum, either by large portions or numerous small areas. The wizard can not traverse vacuum because the inside pressure of his body will blow off his vines. The walls, the door, the floor and the ceiling contain liquid Hydrogen, either by large portions or numerous small areas. The wizard can not traverse liquid Hydrogen because his body parts and muscles will cease to function when frozen. Of course, we are talking about advanced medieval technology, the one when some have "magical" powers and sedating drugs are perfectly well processed so not to kill the patient. Also, the fellow alien civilization colleagues of the wizard must not know where their pal is locates so they can not extract him with teleportation means, as they hunt him for his intrusion in other civilizations history without official contact. Maybe his powers looks magical for us, Terrains (and the people from that Earth-type planet), but, in fact, we just do not have the technology to take advantage of the fact that the matter is only 1/1^18 of the volume is occupying. But, hey, luckily quantum physics is the same either in vacuum and close to 0°K. It's very difficult to design a cell such that a non-wizard can't ever break out given enough time (and nothing else to do!). Plus there's always the chance of loyalists breaking in.. There's only one wizard and the sort of folks who can capture wizards can afford a few guards. Watch him at all times and if he moves outside the designated circle poke him with a stick. Some drugs manufacturers even claim to have drugs that can suppress dreaming so the chance of the Wizard accidentally dreaming a spell can be reduced. And if the trap is going to be made even more dastardly, then the wizard could be made to dream, except in his dream world he is a being of non-wizardly powers. EDIT: Interrogations would be difficult if the Wizard would need to be woken up each time and the risk there is that the Wizard could use that opportunity to escape. But in a world of Wizards (or even advanced aliens walking amongst humans) perhaps another "Wizard" could be found to help? Then through one wizard manipulating the dreams of the other, interrogation could be accomplished. Imprisoning him in his own body seems to satisfy all the requirements, and is certainly well within the grasp of those in this situation and time period. They already have him sedated, and can sedate him as needed. All they need to do is cause paralysis below the neck. He can still communicate, eat, etc with assistance. This doesn't prevent him from committing suicide because while he cannot move himself, he could determine to fall into the earth below and thus suffocate. There may be ways around this but they depend on how exactly his ability works. For instance, being paralyzed and without feeling he may not know enough about the positioning of all his limbs to successfully cause them to pass through matter. As an alternate to sedating him all the time, use the sedative as a spinal block which would temporarily cause reversible paralysis during interrogation sessions, and otherwise keep him sedated. This gives him hope of eventual escape, giving him less reason to attempt suicide. In a space station, or cage suspended in a chasm. Being magical, the suspension can be without ropes or anything to climb up. Can he fly too? Finding out the exact blend of talents is critical to keeping him imprisoned. If he held back some minor talent, he might be able to puzzle his way out. The captor will assume the most useful escape-relevant talents, so the wiz would come upmwith something esoteric to hold back. Build for your wizard a small cottage in the center of a totally flat, large square field. At each of the four corners, build a guard tower. These towers will have braziers that can be lit at night to illuminate the entire field. Each tower will be manned by some of the best crossbow snipers in the kingdom, working in shifts. The bowmen are given orders to shoot your wizard should he stray a certain distance from his hut. You can then put the mage to work. He must dig and build a well for water and construct a privy. Provide him with materials to plant and maintain a garden. Perhaps building something will give this villain some measure of dignity and contribute to his rehabilitation? At any rate, he will soon be self-sufficient and no burden on your medieval society. He will also be utterly unable to escape because he is being watched 24 hours a day. Anyone wishing to visit or interrogate him (with the king's approval of course) can do so easily. He can pass through walls, but he will need to walk in order to do so. Suspend him into a anti-gravity bubble, so that he cannot walk and reach any walls, making his special ability useless. Put him an ordinary medieval gibbet (suspended off the floor, just like every other ordinary medieval gibbet). Station two archers nearby. It doesn't matter that he can step out at will if you make it so that he really doesn't want to. Simple- three guardsman with knives on his throat with round the clock guard. If he blinks strangely slash him. You haven't indicated that he has any powers that will stop cold hard steel killing him or that he has mind-control. If he has easy mind-control then how did he get captured at all. No Dragons and Dragon's wizard could survive that- magic takes time and words. Then you put him in any old normal cell. The problem with all the fancy prisons is that sooner or later someone (maybe himself) will come up with a way to free him. Then again, maybe the escape is the outcome you're after in the long run. If they don't know magic better than he, they cannot be sure whatever they do. Some drastic measures could stop him, but you never know. So maybe: Trim him a bit. They want to keep him alive, so he needs head. But what he needs hands for? He can laye on cold floor and be periodically fed. What he needs hands for? He can lie on cold floor and be periodically fed. He even does not need arms. And if he dies from wounds/infection/sores from long laying, its his problem. You can do what we do today - put the prison in the middle of nowhere. There doesn't even have to be walls or guards. Let him escape - but, he can't travel forever without dying of thirst or hunger. So if his only food source is at the prison site, he cannot escape (unless he steals some food, but then you ensure he doesn't by feeding him little and under supervision). We build prisons in the middle of wildernesses - if convicts escape they are quickly found, but if they didn't, they'd die of exposure in most cases unless they returned of their own volition. Or, if he can't fly - put the prison on top of a tall, sheer, tower that is only accessible via a lift system. Simple: Just tie him with a rope more than 10 meters from the ground. Pass the rope by a sheave, and in the other edge just put a rock with the same weight of the mage. If him try to pass by the rope or something, the weight change and the rope will fall with him. If he fall, he will die when touch the ground or passing the ground. The complexity of the prison seems to depend on how far he can go holding his breath. Well, one scenario is you reduce how much breath he can hold. How about lining his prison with fires, not enough to kill him, but enough that his breath isn't oxygen rich. Then you have the added benefit of torturing this hated man. Solid walls/underground is no fun, you can't see the man. Give him an iron bar cell in an open field, and fill the ground around with spikes nasty enough that he really doesn't want to be standing on them when he runs out of breath. Not the answer you're looking for? Browse other questions tagged magic medieval or ask your own question. Is a horse a suitable familiar for this wandering wizard?